Home » Interesting Discussions » Your Say: Does it make you uncomfortable to buy sanitary pads or tampons? Your Say: Does it make you uncomfortable to buy sanitary pads or tampons? ‘ere I’ve got a curious question for you, as I will often do. I think a lot of you have gotten used to this by now eh? LOL! While we love shopping, as women will, I’m curious to know if this quite compulsory purchase to staunch a monthly discomfort is something you dread or find embarrassed to buy? Me? I don’t feel anything untoward, to be honest. In fact, I’m all for grabbing value packs of sanitary pads when there’s a deal available, and if I find my regular brand sold for cheaper elsewhere, I bulk buy. I gravitate to the Whisper brand (branded as Always in some parts of the world) and on previous travels, I used to notice that it was cheaper in places like Hong Kong or China or Thailand. Oh yes, I’m that mad woman in a foreign supermarket pushing that trolley laden with packs of sanitary pads just because they’re cheaper than buying them back home. The problem of course, is that they’re pretty bulky so my purchases are limited by space rather than price. The reason I got to thinking about this, is because sometimes, as I stand in the aisle, pondering whether I should pick up a back up pack which is on special offer, I sometimes see some women dart in, grab a pack and go, looking a little furtive. Or sometimes, they put it in their shopping basket, but cover it up with something else, like toilet paper, as if they’re embarrassed that they’re buying a pack of pads or tampons. 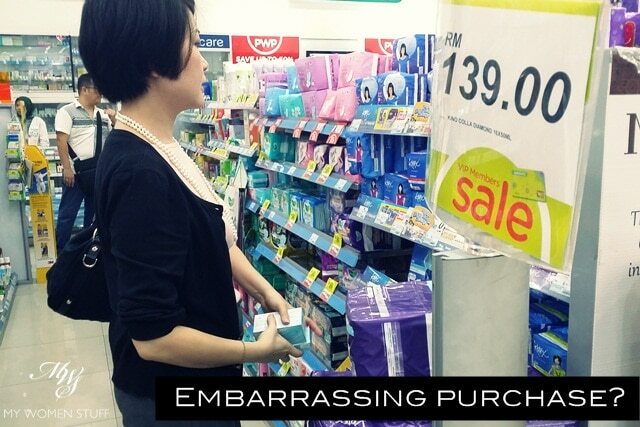 Does shopping for sanitary pads or tampons leave you feeling self-conscious and embarrassed? NEXT POST: According to the new Shiseido Perfect UV Protector SPF50 PA++++ Wet Force, the wetter the better! Hell no. It’s natural. For any men who pooh-pooh or go eww over it, I say grow the *beep* up. I think most women are OK with it, it’s the men who probably grew up thinking it’s stigma or dirty or unnatural. For those, I hope they end up with women who make them buy sanitary products their entire lives. I’ve been known to stand in front of the aisles with my phone calculating the best value for money for tampons, pads,, loo rolls.. Btw, 4-ply loo rolls is the shiznit. Forget Birkins or Chanels. 4-ply loo roll is the new luxury. And what? You got stopped for carrying crisps?! How can?!?! HAHA!! I have no qualms whatsoever lingering in the sanitary pad aisle. I’m a Kotex fan through and through but it’s not available in Japan where I live. In Tokyo, I’ll buy Megami, a very pretty-looking brand that has a butterfly theme – even the “wings” have a butterfly shape. Living in Japan made me experiment with different brands but when I’m outside Japan, I don’t bother and just automatically reach for Kotex. I stick to the Carefree brand outside JP and in JP, I use a brand called Kiyora – which is again, extremely pretty and feminine with a gorgeous design lol! But having said that, the quality is exceptional. The Japanese sure know how to entice their customers. Sounds like Japan is not only the land of everything pretty and cute and adorable, they even extend it to their pads! LOL 😀 I didn’t really pay a lot of attention to the pads when I was in Japan years ago. Maybe I should have – a pad comparison from all over the world LOL! I use Carefree for pantyliners too. For me, they’re the best. Carefree and Kiyora – pantyliner brands. I forgot to mention that! This is a very, very fun and interesting topic to chat! When I was in school, it was so embarrassing, especially when some random guys passed by when my arms were full of Kotex (I never buy just one!) but at same time I was having lots of fun teasing my elder brother about it (He still shies away whenever I go to buy my pads LOL). Those awkward teen years were my most terrible time when it was time to buy sanitary pads. Nowadays, I’m always so excited to see value packaging or if there’s sale on my favourite brand, Kotex; I’ve been using the same brand since my first period, since millions years ago, haha. When there is new product launched by this brand, I almost always buy it because I’m always looking for the longest, widest, most absorbent pad during the first few days of heavy flow (right now, my favourite is the Luxe Kotex in black packaging – slim design with various colours of individual “bag” yet shockingly very good with heavy flow that I almost want to dig around the cotton material to see what’s the secret LOL). The hardest time I bought my pad was at a middle east country. There was no salesgirl, just male employees who barely spoke English and that was the first time after many years I felt my pad-horror feeling surfaced back, haha. There were Kotex pads but the descriptions were mostly in Arabic and I had no idea whether those were for heavy or light flow and it didn’t help that I had never seen those type. I had to grab one of those guy assistant to translate but of course, seeing it was sanitary pads, he nearly jump out of his skin and run away, haha. Haha! I’m glad you found this fun, Fathin 😀 You know, a teacher in school told us a funny story once. She sent her young son out to buy a pack of pads from the kedai runcit nearby, and to remind himself as he cycled away, he shouted “Kotex! Kotex!” at the top of his lungs. Every time I hear Kotex, I remember that story LOL! 😀 I have tried it once I think, but I tend not to go for that brand. Not sure why – habit maybe LOL! But I can imagine the look on the face of that guy in the Middle East! He must have been mortified that he had to not only sell pads, he had to actually HELP someone buy them! LOL! that said, i am certainly not embarrassed to buy it, but i do applaud for men who buy it for their partners though. Ooh you like the cloth pads then? I still never really got the hang of them. Maybe coz I used to work longer hours. I should give them a nother go. Oh and everytime I see a guy buy the pads, I want to give them a round of applause. But I think that’ll embarrass them even more LOL! I grew up in a conservative country thanks to my dad travelling everywhere and they used to put it in a brown bag! The shame! The horror! When you brown-bag something, you automatically drop it to the lowest levels of *disgust* and *I aint touching that*. I actually couldn’t give a hoot about buying it. I have a lot of guy friends and since Sunway Pyramid was so near my Uni, we’d go out for lunches and I’d hop into the store to get sanitary pads and walk about with them WITH my large shopping bags filled with pads. My mother, however, is a different story. She’s so hush hush about everything intimate about being female that I have to hang my lingerie in a specific way even in the privacy of my bathroom. When I was younger my dad was always sent to the shop to purchase this for mum, my younger sister and myself. These were the Kotex brand that came in a box – and it was an unspoken understanding back then that the shopkeeper would wrap the box up in paper before putting it in a plastic bag. I have never been shy about purchasing them later in life when I was away for studies and now when I do my monthly grocery shopping – I take requests from my two teenage daughters who have their preferences!! Glad too that my hubby is more than happy to buy these for us when we inadvertently run out! He thinks it takes a ‘real man’ to be able to stand in line with sanitary napkins tucked under his arm and thus has no problem buying it!! Your husband deserves a round of applause! He’s right – not many men want to stand in line with packs of pads in hand, especially when it’s a product that’s 100% for women only! 😀 I think it’s quite funny how pads was always a bit of a taboo thing until they hit the supermarket shelves I suppose. These days, everyone seems to manhandle them at the cashier with no problems, and I’m glad there’s no more brown-bagging of pads! Me? Never! Haha but I do know what brand and type I already like so it tends to be pretty quick since I only ever pick out the same packet! Yes I think Whisper is a SEA thing. I don’t know why. I remember the first time I went overseas, I panicked because I couldn’t find Whisper in the UK. So I picked up Always, because it looked similar (and I have to say that pads in the UK are incredibly expensive! I used to bring a year’s supply 😛 ) and then I later found out that in the rest of the world, it’s branded as Always. I never quite understand these branding things LOL The lining is still plasticky but I like the dry feeling (TMI?) as compared to some other cottony ones I’d tried before. Not sure if we get Libra here though! I’m one of those people who would stand at the aisle, calculating price per pad, comparing brands, etc. Speaking of guys buying pads, it reminded me of the show Kopitiam where Rashid Salleh’s character tries to hide the errand from the rest, but they could hear him ask his mother on phone, “wings, or no wings?” in the pilot episode, ROFL. I do like Libresse because they don’t have little square backing paper for the adhesive under the wings (that a lot of brands do, which creates such a mess), it’s just the one long rectangle backing paper (or not) for the bottom. I kinda wished there were adhesive free pads so they don’t ruin underwear (if you know what I mean?). I remember using Kotex in the States which didn’t have adhesive under the wings, but worked like velcro. LOL You know I just watched most of Season 1 of Kopitiam on my trial subscription of iflix and I totally remember that episode! Did you watch it too? 😀 I haven’t tried Libresse but you know what? I hate that silly piece of paper too! I found that most of the Whisper packaging from overseas didn’t have that, but the local ones did. So complicated sometimes 😛 I’d already got a ready stockpile so didn’t stop up pre-GST but I can imagine that additional burden on us. As if we didn’t have enough burdens already! 😛 I’ve never tried non-adhesive pads, but you have me intrigued! Does it require special undies? No, doesn’t require special undies but they miraculously don’t budge without adhesive. Dunno how they work – friction and static energy, maybe? Interesting topic! I buy this without much thought, or my boyfriend will ask me what I use and add to the grocery shopping. We’re all humans and it’s an essential item, like toothpaste so I don’t think anything of it. I can’t remember if I was embarrassed about it in my teens, but then I haven’t felt embarrassed about it for a long time, because I consider it to be in the same family as toilet paper. Nobody gets embarrassed about buying toilet paper cos it’s just a necessity item, right? And I have also ever spent time calculating price per pad in the supermarket aisle, but nowadays I just go for the brand I like: Laurier for pads and Carefree for pantyliners. Hehehe I guess I can stop feeling kinda bad for asking you to lug Tesco Value pantyliners for me from Malaysia. This is a good question; if you asked me this many years ago, I would have said yes. It’s not so much of picking and choosing feminine hygiene products; it was more of the men who would be ringing up my purchases. As I grew older, the feeling of embarrassment went away. If I get any sort of reaction from male checkout staff, I get snarky at them. There’s nothing to be embarrassed about. I remember buying condoms once and I got such a look from a male cashier. I stared him straight in the eyes and said “WHAT?” He was shocked at the fact that I wasn’t embarrassed. Why should I be? Now I’m the one who would stand in front of the feminine hygiene aisle, looking at the cost per pad/tampon, calculating which ones are cheaper, which ones are on sale. Have to lah, expensive being a woman wei. 😛 Tim doesn’t give two hoots about buying tampons/pads for me either. He’ll even call me on the phone and ask “EH WHAT BRAND ARE YOU LOOKING FOR AH? WINGS? NO WINGS? TAMPONS YOU WANT SUPER OR NOT?”. Kekekeke! Haiyo woman, it can’t possibly still be bugging you?! But no, it was no trouble and you were right, they were exceptionally good value and good! But I don’t go to Tesco very often so I stopped buying them. Thanks for reminding me though – I’ll stock up next time I’m there LOL! 😀 I actually am amused when I see the discomfiture of the cashier. Really, if they want to be uncomfortable ringing up a purchase, then you can’t be a cashier! But that was a good response you gave him – so what right? You’re not stealing anything – just buying condoms. Grow up 😛 Oh and Tim is officially a “real man” by JackieA’s husband’s book! 😀 Good for him! Amazingly my husband is more comfortable buying napkins for me than when i do it myself! Here in the US most napkins come in Large sizes. I’ve also noticed they are 6x more expensive than the prods we have in the philippines! I can get the best brand there for a dollar! I buy the cheapest ($3) and thankfully better than the $7 ones, can’t imagine spending that much on sanitary pads! I don’t cover my pads like some people but they are sold near the men’s razor aisle so i do still feel a bit embarrased about it. I’m not embarrassed at all! As a woman, why should I? It’s completely natural. In fact there was once I wanted to try out tampons, I even asked my friends through a Whatsapp group conversation where everyone can see (all are women, of course). Ended up, we all discussed about which brand has the best pad and tampons. Hmm as a guy I don’t really give any care or deem it to be weird or “un-natural” but that may be because I have lots of friends who are girls hmm. Anyways, I don’t know about the feeling of embarassment of ladies/girls when buying their lady stuff but it might be similar to the embarassment that I’ve experienced when buying anything cosmetic related either in drugstores or (especially) departmental stores. Often in departmental stores, I’ve often ask the SA to color match me for the foundation or concealer than I might get. Every so often, people will walk by and just stare at me or give me ‘that’ look as if to say”guy? Makeup? Wha..srly?”. It just..makes me… uh.. ranted it on my blog just to make sure I was sane lol. Anyway, it sometimes just gets to me and makes me insecure about my passion and sometimes embarassed when people just walk by > stare > whisper to their children (happened mostly in Malaysia). Uh. Sorry for getting off-topic, just figured I’d share. I am a grab and goer- not out of embarrassment, though when I was younger I used to find it an embarrassing purchase. I simply know exactly what I am looking for, and being a native New Yorker also only know one speed. So once I locate it I take off again. I will say, one sure fire way to cure your embarrassment over feminine hygiene products is to have to buy diapers for a parent. Way more embarrassing. Ouch that is true Jayme. I had to buy a pack of adult diapers for my late gran once and it was an uncomfortable experience I agree! Most of the time, I’m a grab-and-go too – once you know what you want, more speed, less haste! I confess! I’m one of those terribly embarrassed women you spot at those aisles! I think it partly comes from being in a conservative family and also partly remnants from that awkward, thin-skinned period known as my teenage years (alas, those are now many, many years ago). I’ve only managed to overcome my embarrassment at pharmacy cashiers recently – I can finally look at male cashiers in the eye when ringing in my purchases. My favourite brand for pads is Laurier. Whisper tends to irritate my skin, not sure why. The Laurier slimguard series is soft and really absorbent despite being really slim..
Yay for baby steps to overcoming the embarrassment 🙂 You know, I started out wearing Laurier many moons ago, but I didn’t like them because they didn’t make the super thin versions. I don’t even know if they do now! But I’m trying some from Sofy which are super cheap (I got them in Bangkok) and they work really well without irritation too!